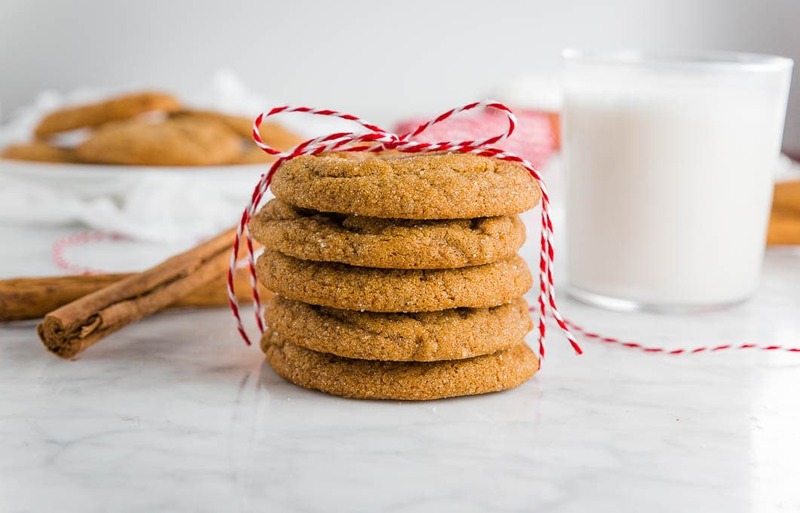 Chewy ginger molasses cookies are a holiday classic! You’ll love this gluten-free vegan spin on the traditional cookie that is so soft and chewy, you seriously won’t believe it until you take a bite. Perfect for easy gluten-free holiday baking and entertaining! Which holiday cookie is your favorite? Growing up, my favorite was always the molasses cookie. Soft, chewy, crackled tops, perfectly spiced. Cinnamon, cloves, ginger and molasses. All the good stuff. Seriously, how can you go wrong with a chewy ginger molasses cookie? These chewy ginger molasses cookies are gluten-free, dairy-free and vegan and SO easy to make! I know I’ve already said it a few times, but I can’t even begin to describe how soft and chewy these gluten-free cookies are. In fact, this recipe went through quite a few test rounds to get that perfect soft and chewy texture. Don’t get me wrong, the first 5 versions were good… they just weren’t perfect. I would take a bite and NOPE. Not that chewy factor I’m looking for. On the final batch, he took a bite and said “Oooooh I get it. Now I know what you mean!” YES! CHEW FACTOR CERTIFIED. 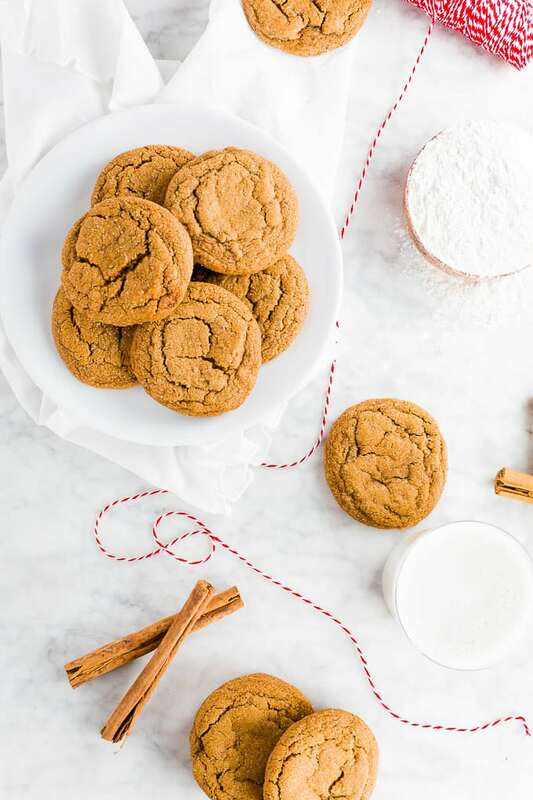 These chewy vegan gingerbread cookies are bakery-style soft and every bite has a slight chewiness you expect from molasses cookies. 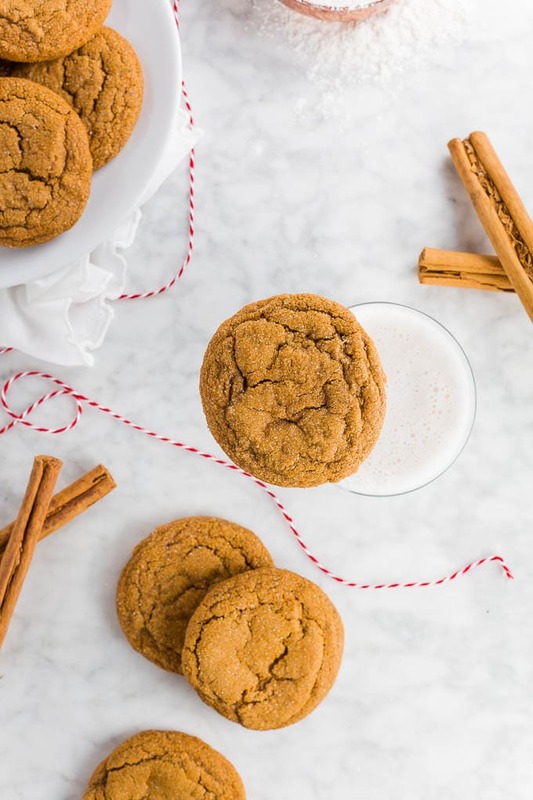 Whether you’re making them for a holiday party, a cookie exchange, or just to make for a sweet treat for yourself, these chewy ginger molasses cookies are the perfect cookie this holiday season. We’re calling these cookies chewy ginger molasses cookies because it just felt right. 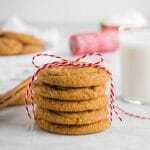 Ginger molasses cookies.. gingersnaps… gingerbread cookies… What’s the difference? Honestly, I didn’t really know so I did a little research to find out! 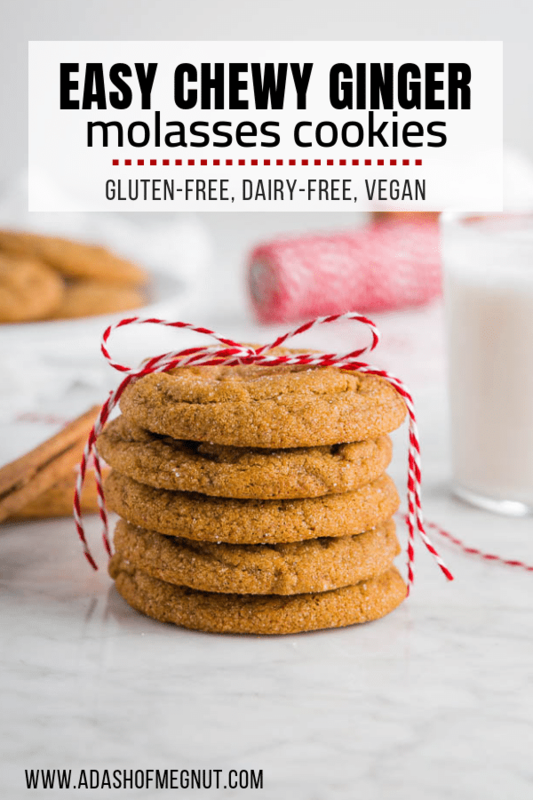 Typically molasses cookies are soft and chewy which is what really differentiates them from gingersnaps. 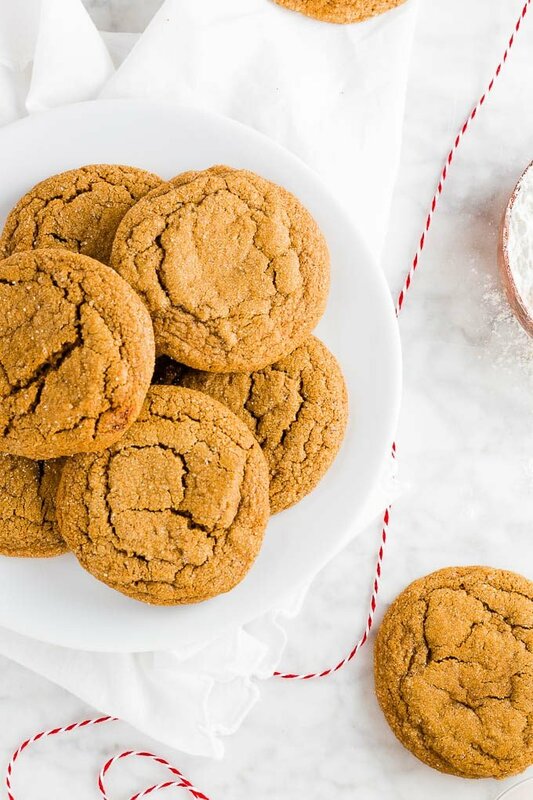 Gingersnaps tend to be crispier than molasses cookies. Gingerbread cookies on the other hand are crispier than molasses cookies but not as much as gingersnaps. They still have a slightly soft bite, similar to rolled sugar cookies. Gingerbread cookies are also typically rolled out and cut into shapes instead of scooped and baked like gingersnaps and molasses cookies. These cookies are not only gluten-free, but they’re also dairy-free, egg-free and vegan! Instead of using dairy butter, we’re using a vegan butter, such as Earth Balance, for these cookies. Though I have not tried it, you could potentially use shortening, such as Nutiva. However, I like the buttery taste from the Earth Balance so that’s my recommendation. To replace the eggs, we’re using a flax egg made from water and ground flaxmeal. If you haven’t made a flax egg before, it’s super simple to do. All you have to do is stir together 2.5 tablespoons of water with 1 tablespoon of flaxmeal in a small bowl. Let it sit for 5-10 minutes before you need to use it. The mixture will get thick and a little goopy, which means it’s ready to use! Sugar is also a consideration when baking vegan. If you are strictly vegan, you definitely want to take a look at the types of sugar you are using. Many brands of cane sugar are not vegan because they use bone char as a decolorizing filter to get that super white color. Beet sugar is vegan and there are some brands of cane sugar that are vegan, too. Just be sure to check. I know, I know. You’re baking cookies and the last think you want to do is wait while the dough is chilling. But I promise you. It’s SO worth it! This dough is super sticky and if you don’t chill it, it’s a little hard to work with to get it into the ball shapes. Plus, chilling the dough helps keep the cookies nice and thick while baking instead of spreading too thin. No one wants a thin cookie! These cookies taste best after they are completely cooled. In fact, they tend to taste even better the day after baking. Straight from the oven, they just taste soft. But the molasses flavor really shines through after cooling. Spray your measuring cup with cooking spray so the molasses easily comes out of the measuring cup! This also works great for anything sticky, like honey or peanut butter! Use a cookie scoop to get perfectly sized cookies every time! I have different sized cookie scoops whether I want smaller or larger cookies. If you don’t have one you can use a tablespoon, but I highly recommend a cookie scoop for easier baking! If you’re baking gluten-free, make sure you do not use cooking spray that has flour added to it. Many times it’s called baking spray. This is not gluten-free. I personally love to freeze baked cookies so that I can have a sweet treat whenever the hunger strikes. Baked ginger molasses cookies will store in the freezer for 2-3 months when they’re properly stored, but mine always get eaten normally within a month. Wrap well in plastic wrap and freezer safe bags or containers. To serve, let sit at room temperature. Though, I won’t lie.. these also taste great frozen! You can also freeze cookie dough before baking for months. To freeze cookie dough, portion it out into balls and place on a baking sheet and freeze until firm. Then, put the frozen cookie dough balls in a freezer safe bag for storage. Baked chewy ginger molasses cookies stay nice and chewy at room temperature for about 3-4 days. They will start to get a little crispy after that, but are still good to eat for another 3-4 days after that. 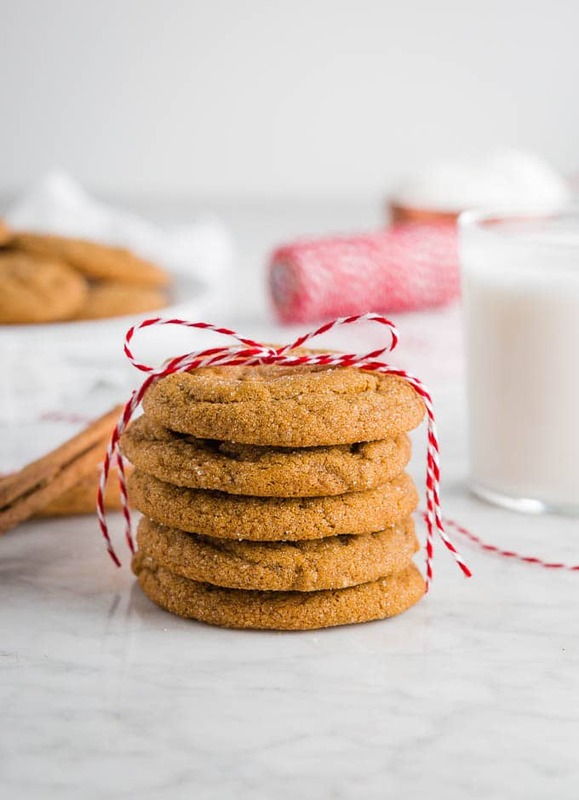 Chewy ginger molasses cookies are a holiday classic! 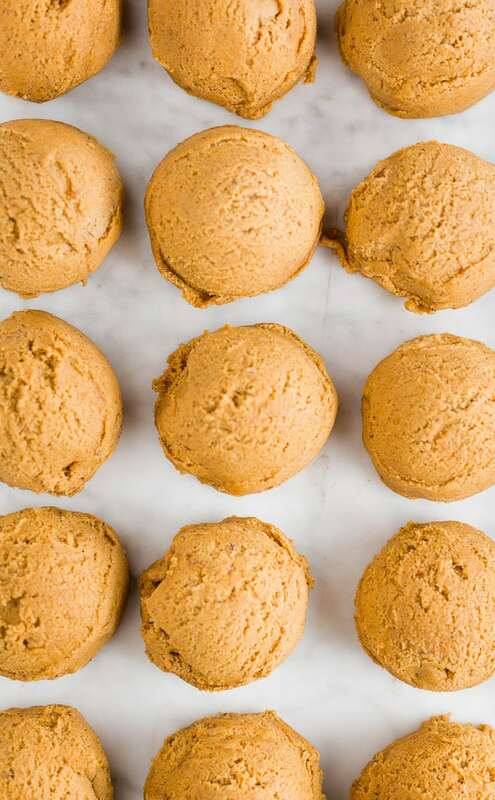 You'll love this gluten-free vegan spin on the traditional cookie that is so soft and chewy, you seriously won't believe it until you take a bite. Perfect for easy gluten-free holiday baking and entertaining! Combine water and flax meal in a small bowl. Mix well. Let sit for 5-10 minutes, until consistency is thick and gel-like. Cream together vegan butter, brown sugar and granulated sugar about 1-2 minutes, until light and fluffy. Add the flax egg, molasses, and vanilla and mix until combined. In a medium bowl, whisk together gluten-free flour blend, xanthan gum (if using), salt, baking soda, baking powder, cinnamon, ginger and gloves. Gradually add the flour mixture to the wet ingredients and mix until combined. Chill the dough in the refrigerator or freezer at least an hour, until completely firm. Dough should not be sticky. Scoop out in 1 inch balls and roll in granulated sugar before placing on a baking sheet lined with parchment paper. Bake at 350F for 10-12 minutes, until edges are set. Remove from over and let sit for 5 minutes before moving to a cooling rack to finish cooling. Cookies will get chewier the longer that they sit.